I've been wanting to make these crate stools for 6 weeks - that's when I first pinned this one from What the Teacher Wants. 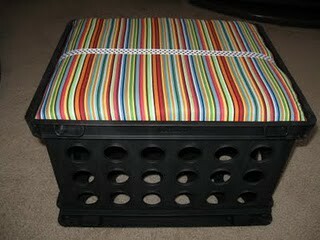 She has fabulous (and entertaining) how-to instructions for making these crates. Anyhow, long story short ... they're done and they're FABULOUS! The colours fit my new theme PERFECTLY ... Yay! Did you have trouble with the corners? Did you have to round them out with a sander? This is what stopped me dead in my tracks from undertaking this project. Your seats are adorable. What did you use for the cushions? I did have to round the corners a bit. I have a palm sander though, so it took no time at all. I used foam pads for the cushions (they are about 1 1/2 inches thick). They were just under $5 at Walmart. Those are really, really cute. I have thinking of making those, too. We have so many furniture limitations that I'm worried that I won't be able to use them. Nicely done, though! Wow, I love the fabric you chose! Those came out GREAT!!! I love your fabric!! I (well, my dad) used a power sander to round my corners....! Ha, nicely said! I'm feeling good than previews class. I think this part is really good for this lesson. Keep it up!